"I've never been ganked," says the rebel. "I don't need a mining permit." Then why, sir, do you carry those scars? Why does your blood boil every time a member of the mighty CODE. alliance enters local? And why does your alt's killboard showing you losing half a dozen Mackinaws to CODE.? VodkaMARTY Rayl tried to pull a fast one--or should I say "a slow one", given rookie ships' low top speeds?--by sneaking around in an Impairor. 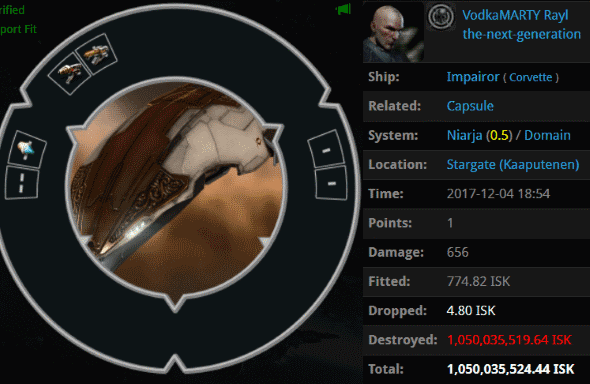 Carebears, if you think our Agents won't gank a rookie ship, you haven't been paying attention. 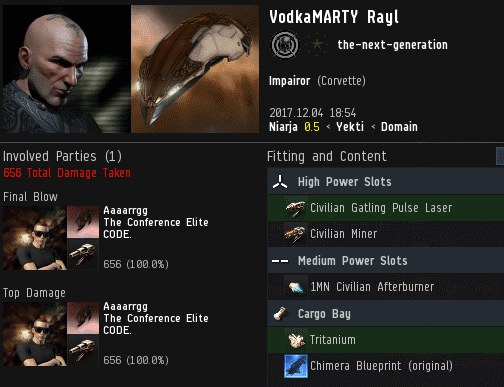 Agent Aaaarrgg followed protocol and eliminated VodkaMARTY's billion isk Impairor. The rookie ship contained a carrier BPO. Aaaarrgg would've been just as willing to gank the ship if it had only been carrying the unlicensed unit of Tritanium. The appropriately named Darth Lazy tried to send mixed messages with his shield mods and anti-tank lows/rigs. Or, as some Agents refer to the setup, "tank in the front, bot-aspirancy in the back". Nothing less than 100% Code-compliance will save you in Uedama, friends. Agents Votre Dieu and Narl' Amhar knocked out the hauler and chalked up a 6.5 billion isk killmail. 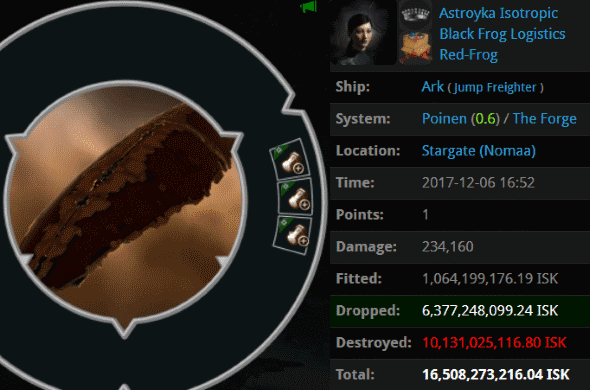 Astroyka Isotropic is a member of Black Frog Logistics, a division of Red Frog Freight that specializes in courier missions that go through dangerous lowsec and nullsec regions. Astroyka forgot that if you don't have a mining permit, highsec is at least as dangerous--in this case, more so. Her courier mission failed because the mission of our Agents succeeded: Agents Tax Collector Max, Australian Excellence, Tax Collector KarlMarx, Tax Collector Kimi, Tax Collector BokChoy, Tax Collector Hill, Tax Collector Kittens, Tax Collector Stroheim, Tax Collector Yuna, Tax Collector Larry, Tax Collector AynRand, Pod Destroyer Molly, Tax Collector Richard, Tax Collector Aruka, Tax Collector Alison, Taxman Daniel, Tax Collector HongMei, Tax Collector Shardani, Tax Collector Fuemi, Tax Collector Buck, and Mining Lord 1999. Arashi Reza, too, lost an Ark-class jump freighter. 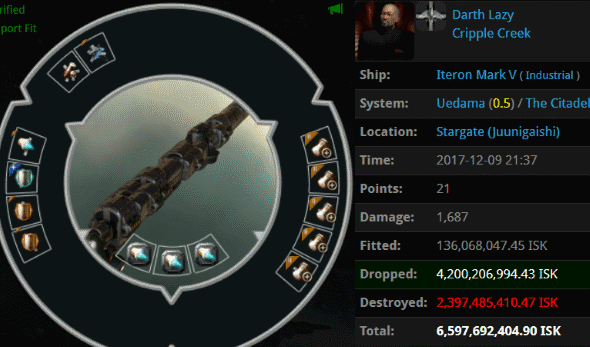 Hers was even pricier, weighing in at 17.5 billion isk. Autopiloting is expensive these days. The New Order's Russian friends, Agents BOBKA Morkovka, Votre Dieu, HABEPHO, Elizabet Hildebrand, kali laska, Alarika Maleus, Narl' Amhar, Bastian Mart, KENTua, KaMiKaDzExD, AndroGon Navy, Vollond, and Sumail Serine, used Taloses to pull off this extremely efficient gank. Agents Pod Destroyer Molly, Tax Collector Kittens, Australian Excellence, Joel Kusion, Justin Kusion, Jayden Kusion, Tax Collector KarlMarx, Tax Collector Aruka, Tax Collector Hill, Jayson Kusion, Jackson Kusion, Jason Kusion, Jeremiah Kusion, Jake Kusion, Tax Collector Richard, Joseph Kusion, Tax Collector HongMei, Tax Collector Stroheim, Johnathan Kusion, Tax Collector BokChoy, Taxman Daniel, Joshua Kusion, Tax Collector Alison, Tax Collector AynRand, Tax Collector Kimi, Tax Collector Yuna, Tax Collector Larry, Tax Collector Shardani, Tax Collector Fuemi, and Tax Collector Buck. Carebears, if the Tax Collectors and the Kusions come after you at the same time, you may as well log off and play another game. This is the second week in a row that our Agents took down a Kronos who was using purple mods. Is this the beginning of a trend? You had better believe our Agents are watching these developments closely. 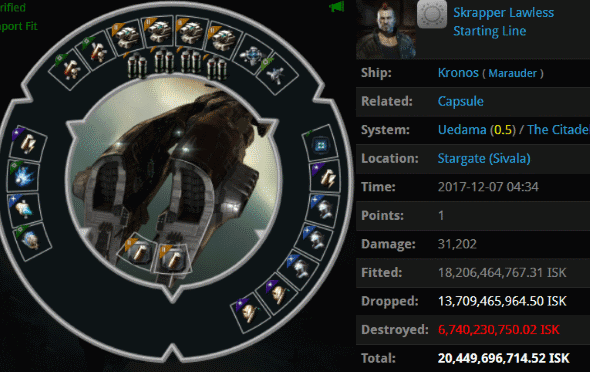 Skrapper Lawless didn't suffer enough with his Kronos loss. No, he had to lose his pod, too. 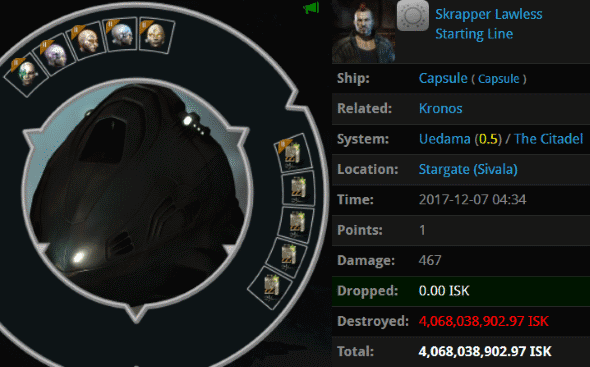 Agent Tax Collector BokChoy won the race and smashed Skrapper's implants, adding another 4 billion isk to the butcher's bill. wow just wow. another week of non-stop failing daily continuously ALL the time from antiganking. Damn what an embarrassment. they are anti-ganking but just fail so hard non-stop daily. More worship of your favorite code agent. Good job fail bot. "Carebears, if the Tax Collectors and the Kusions come after you at the same time, you may as well log off and play another game." That's a bad day if youz a slimey ag carebear! 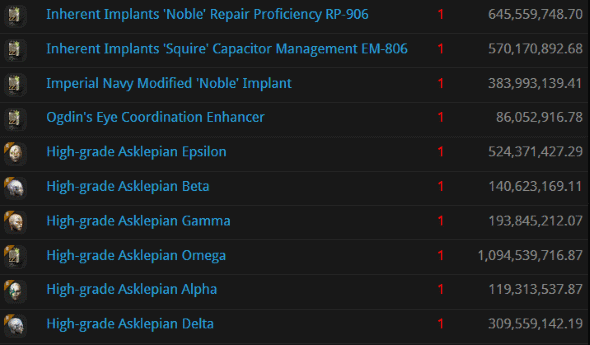 Looks like Skrapper's (armor repair amount) Asklepians couldn't save him from the combined efforts of clan and club. I still wonder about the state of mind of someone flying all that through Uedama, of all places..
or how long ago said mind was lost.